Ptch, the DreamWorks Animation-incubated mobile video startup, has been acquired by Yahoo. The app was launched just over a year ago and will shut down on January 2, 2014. Until then, you’ll be able to download your ‘ptches’ if you’re a user, or save them out to your camera roll. The announcement was made on the Ptch blog this afternoon. Due to the text of the announcement and the fact that the product will be shuttered, we’re calling this one an acqui-hire. Terms of the deal were not disclosed. 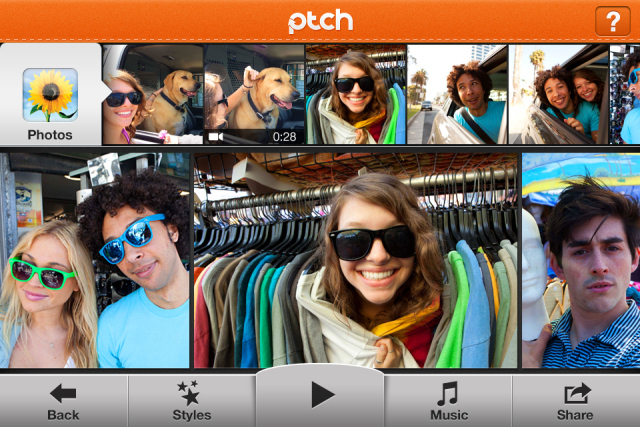 Ptch was an app that started inside DreamWorks Animation, as a project of its CTO Ed Leonard, who ended up taking on the CEO role. Co-founder Hans Ku also worked at DreamWorks. When we spoke to the Ptch team last year, there were around 20 of them, about one-third of which came from DreamWorks. About two-thirds of them came from outside places like Yahoo and Myspace. Now, it looks like some of them will boomerang back to the big purple. The app allowed users to remix their videos with effects and music, and to offer their original clips up to others in order to mash them up and remix them further. The concept was centered around allowing friends and people with shared experiences to use all of their combined media to craft the ‘story’ of the event. There’s no word on where this leaves DWA Investments, the separate company that was funded by DreamWorks and which created Ptch. Since it’s equity-owned by the employees, it seems like it would go along with the acquisition, likely to be dissolved. This continues Yahoo’s strategy of absorbing talent in the mobile app design and development space. Yahoo is in the process of retooling all of its offerings to be mobile-centric, and developing new properties to bolster its media empire. In order to do that, it’s been snapping up small teams and products that have strategic value of some sort, but mostly for the people.